Good, quality promotion is crucial for the success of any business, but this especially stands for musicians of any kind. Being talented and dedicated to your music career usually isn’t enough and people in the music industry have to keep thinking of new ways to make their music heard by the masses and attract people who appreciate their work. If you decide to do this by creating a website for your music business, starting off with WordPress is a wonderful idea because there are many themes specifically created for musicians, singers, bands and DJ’s. In this article I will introduce various themes that are perfect for musicians and singers. If you are a nightclub owner or you are a DJ and want a theme that represents your music/club in the best possible way, you should follow this link and check out another article called “The best WordPress themes for DJ’s and nightclubs”. Let’s stop bubbling here and start checking out some awesome themes I’ve prepared for you! Beatheaven is created by ThemeFuse and it looks truly remarkable. Apart from the super easy one-click install system, this theme offers many useful features. It lets you play a background track on your website, but it also lets you add videos, calendars, a nice looking guestbook, and it also comes with a pretty looking slider where you can announce upcoming shows and events. The theme is extremely customizable, you can change the color schemes as you wish and make the whole theme fit your own style. It’s responsive; therefore it is going to look perfect on all devices. In case you are planning to buy this theme, check out these Themefuse coupon codes for some discount! Event was created by ElegantThemes and it represents a very versatile theme with the help of which you can transform your blog into a full featured events website. It looks very pretty and it allows you to manage past and future events like gig invitations or reports with ease right from the WP dashboard. Everything is displayed on the homepage with an interactive and intuitive calendar. Five unique color schemes are included so you can choose the one that suits your style best. Check out these ElegantThemes coupon codes to buy their themes with some nice discount! Harmony is a beautiful looking theme developed by ElegantThemes and it is perfect for bands and all sorts of musicians. 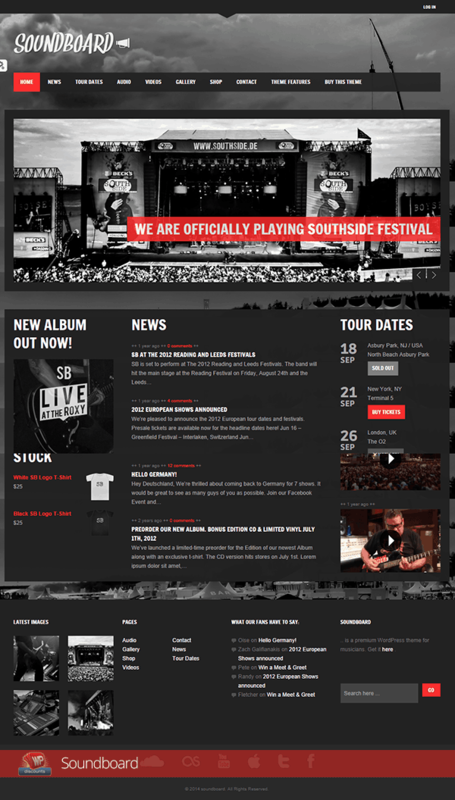 Everything a band could ever need for their website is featured in this theme. You will be able to play songs, easily handle events, create attractive photo galleries and sell your merchandise to your fans. Huge, eye catchy background images are features and they give the whole theme a bold look which is going to make your website look unique. Several compact theme templates are included and with a bunch of shortcodes along with easily manageable theme options, you will be able to run your website all by yourself. Setlist is designed for music bands with its cutting edge design style and many useful features. A photo carousel slider is included for featured articles, and event calendar is also featured and it displays any kind of events with a very simple module for adding or editing the events. All popular audio players are supported by the theme, and you can manage your own banner ads or add your own likebox for your Facebook account, along with your Twitter stream. Five different color styles are presented for you to choose from. Tuned Balloon is very easy to use. It looks incredibly pretty and it comes with a flexible layout that is going to make your theme look awesome no matter what device it is seen from. The theme uses basic WordPress options so you will have no trouble finding your way around it. It can be tweaked and customized any way you want to through the WP theme customizer. You will get stylish visit cards as a bonus with this theme. 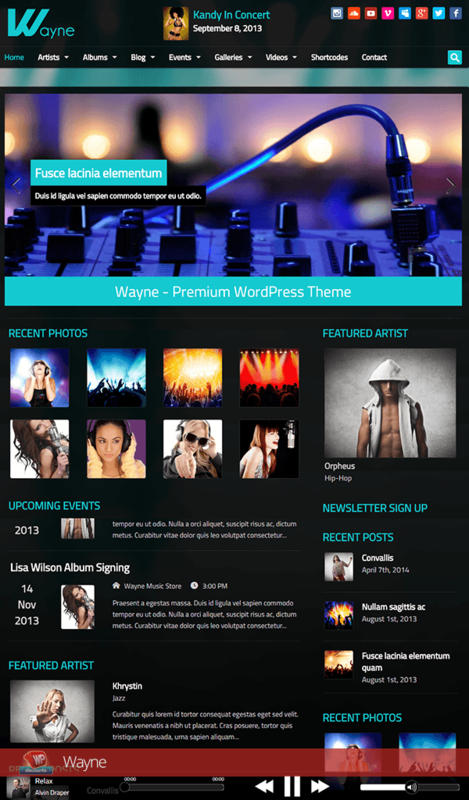 Wayne is a feature rich theme with a responsive layout, designed for anyone who’s in the music industry. Continuous auto play while navigating through different pages is featured so your fans can listen to your music while browsing your website. Pages get loaded through PushState, and if the browser doesn’t support it, they load normally. Several custom post types are presented and there is a theme options page for detailed customization. 12 custom widgets are included. Tribal is created by Gorilla Themes. It looks very fun and compact, and it features several various page templates so you can make your website look super interesting and unique. You can add your own logo and styles easily, and translate it into your own language. Adding a video or audio player is easy; all you need to do is paste a code and you’re done. Brooklyn is easily manageable allowing you to easily install the theme and start posting articles right away. With the simple drag & drop system you can add your widgets quickly, give your modules and categories a name and start posting instantly. A beautiful slideshow is featured on the homepage along with an audio-video player module that is compatible with iPhone, iPad and Android devices so you can post your tracks and not worry about them sounding messy regardless of the device used for viewing the website. Fan Club is designed for artists and fan clubs to showcase their art with great style. It installs very easily and quickly and you can drag & drop your widgets to make the website creation even faster. A pretty slideshow is also featured for presenting your most remarkable photos and events. Facebook and Twitter widgets are included so you can connect your website to these popular social networks. Acoustic supports WooCommerce that makes it perfect for selling your goodies to your fans without trouble. It features a lively layout and a bunch of custom post types so you can create your posts and pages and make them unique. Discography management is included with Taxonomies featured. You can also add videos from various websites and you can create beautiful photo galleries as well. Pendulum has a modern template that lets you create a super attractive portfolio for your music. The admin panel is easily manageable you won’t need any advanced skills to use it. The R- panel featured gives you plenty of handy options. You can also add sliders, YouTube and Vimeo videos to every page of your website so each page and posts looks different and unique. Unlimited color options are presented as well as a background generator. Music is an intelligent theme created for the music industry. It is very easy to use and customize and it features options not to be found in most other themes. You can choose between a content slider or an image slider for your website, they both look pretty. With a Facebook fan page included you can promote your music on Facebook as well, with a pretty page that matches your website. 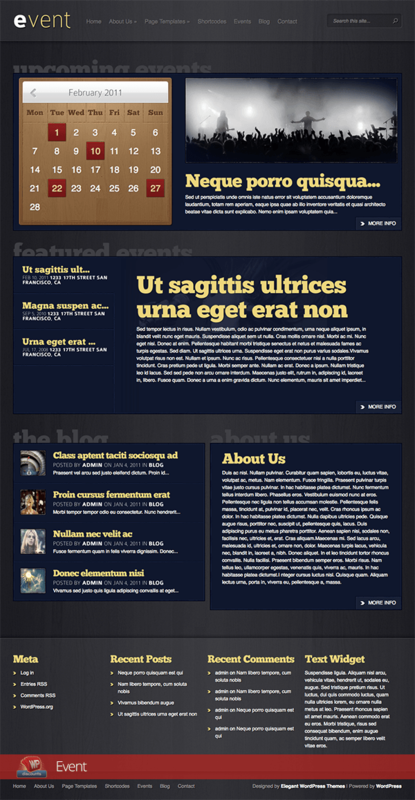 A unique blog layout is presented and several awesome custom widgets are included as well. Soundboard features many special options for bands and musicians. This theme allows you to display your tour dates, manage and present your discography, add various videos and images and you can even sell your merchandise through your website. Six custom widgets are included allowing you to announce upcoming tour dates, present your latest albums and pictures, latest videos etc. It is very easy to use. Iron Band is perfect for any music type, but especially for rock and metal musicians thanks to the specific looking layout with many interesting details. The control panel is easy to work with. All major, important features are included in the theme so you can have events and gigs organized and presented, but you can also add an audio player, YouTube videos, news, create your discography, biography and attractive looking photo album. There is a booking section included as well. 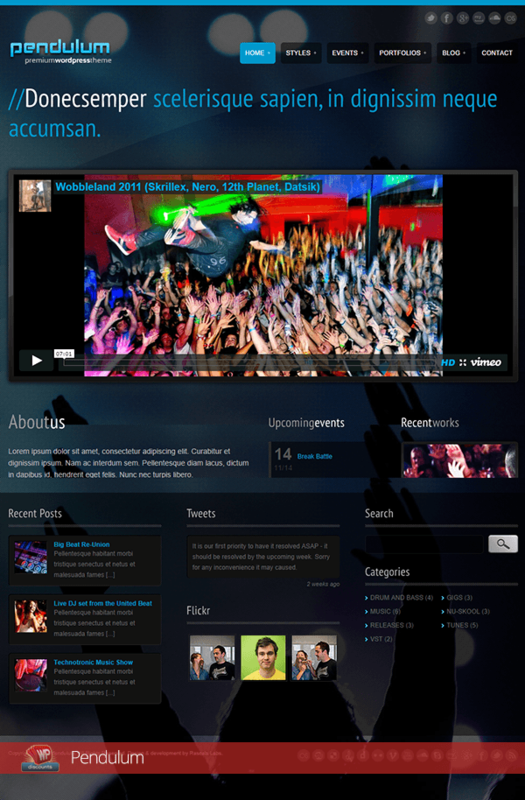 Rock Palace features a unique rocking style with a responsive layout design. The slideshows include video support, and you can also add audio, video and gallery posts. 3 different slideshows are featured along with fancy animations. Color customization is very easy from the admin panel. It is also responsive and it looks great on all devices. Live! is very user friendly and easy to setup. The layout is fully responsive and retina ready. WooCommerce is included for selling your merchandise through your website. A header slider and Revolution slider are included for showcasing your most important content. 3 preset skins are featured and unlimited customization is possible. Multiple playlists can be created along with detailed discography, tour dates, video gallery etc. Social share buttons are featured as well. Brooklyn Indie Band is modern and pretty but also classy and elegant. It is completely responsive and it features a simple admin add-on for easy customization. There are two theme styles you can choose from and with color actions included you can make the theme look exactly as you want it to. 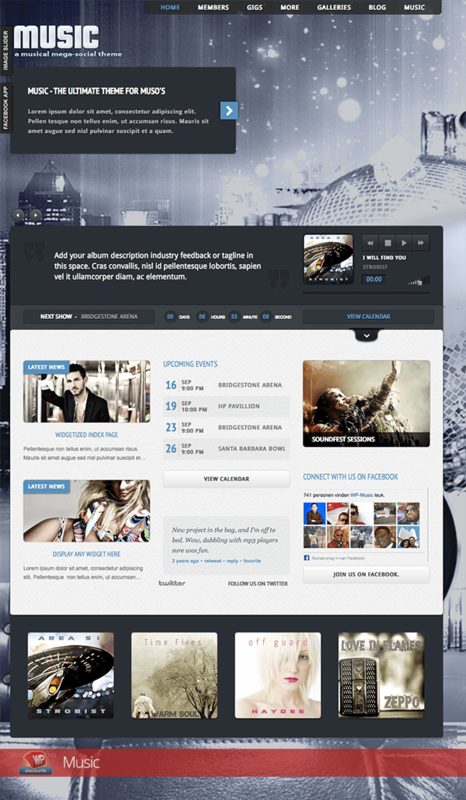 Creating a wonderful looking music website is easy with these incredible themes. No matter what your music genre is, surely you can find one of these fitting your style perfectly. You don’t need to hire a professional to handle your website for you, you can do it all by yourself even if you have no special skills. Do you know of any other themes for bands and musicians I might have forgotten to mention? Let me know! 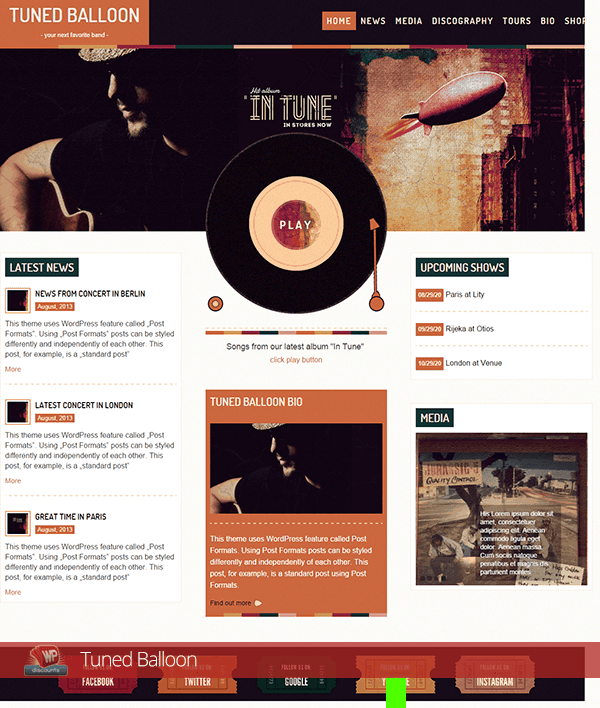 You can try MusicTune WordPress theme for it. It has some very good features like event listing, manage artists, footer music player, fully responsive, cross browser compatibility etc.